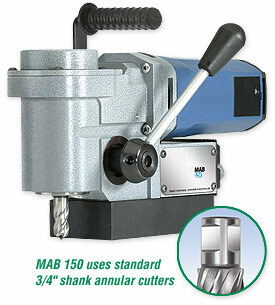 MAB 150 – Portable Magnetic Drill | Advance Drills Inc.
* Model MAB 150 accepts cutters with a 3/4″ weldon shank and a maximum depth of cut of 1″. Automatic internal lubrication with pressure pump bottle. 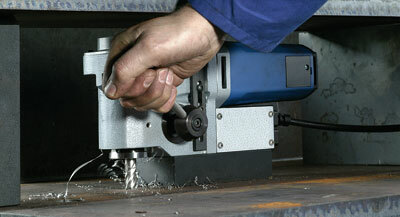 Switches for power and magnet adhesion are arranged for simple, uncomplicated operation. Magnetic Force (1″ plate) 2640 lbs. Standard Equipment also includes auto lubrication, safety strap, carabin hook, gloves, safety glasses, ear protection and allen keys. † Steel case intended mainly for shipping purposes; damage may occur in transit.